When the customer buys your product, he is buying a thing. When he is buying your services, he is buying your time. There is a fundamental difference between selling a thing and selling your time. That goes for the proposals you have to write as well. When you sell a product, the customer can “test drive” it. He can take it for a spin, kick the tires, see how it accelerates in the straight-aways. If you’re selling a software application, for example, he can load a demo, move the mouse around, click on some pull-down windows, get a feel for the product. In a sense, a thing helps sell itself; the benefits are—or should be—self-evident. For sure, your proposals for products have to call out benefits to the user of the product. But it’s easy to bolster the claim by also saying, “Here, see for yourself.” The product itself also serves as way to differentiate itself against the competition. The customer can test drive two different products and decide which is the best one for him. It’s not so easy when you’re selling services. When you sell a service you don’t have the luxury of offering a test drive. There is no “thing” for the customer to touch and feel. Sure, sometimes you can show him the results of your services-a highway interchange you designed, say, or a copy of a networking plan you drafted for a client. But it’s not the same as selling a thing. What you have to realize is that when you are selling a service, you are essentially selling Value. You are saying, “Pay for my time and my experience and my brainpower, and I will give you a higher return on your investment.” Then you have to convince them that you will. And sometimes that’s a tough sell. How do you sell value? 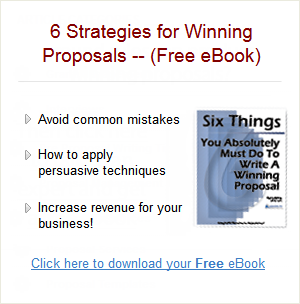 What can you say in your proposal that makes the case that you offer what the customer values? What the heck is value? The answer to this is simple: Value is whatever the customer thinks is valuable. Saving time may be valuable, and if that’s the case, your proposal needs to focus on how you will meet-or beat-schedule deadlines and still give the customer the other services he wants. Saving money may be valuable, and if that’s the case, your proposal needs to show how you will give the customer what he wants at the price he can afford. Knowing that you are using the latest and greatest technical solution to a technical problem may be valuable. Reducing employees’ anxiety while you implement a new training procedure may be valuable. Making sure the customer’s customer is happy may be valuable. You get the picture. The fact is, when you are selling the value your services bring the customer, you have to find out what is valuable to the customer! This means that you have to talk with your customer before you write the proposal. Find out what is valuable to him. Then structure your proposal so you can show how what you are offering will scratch his value itch. If you assume you know what the customer wants without asking him, you will be wrong. You cannot make assumptions. Don’t assume that everyone is concerned about price, for example, so therefore you should low-ball your services. Or don’t assume that everyone wants the latest gee-whiz technical solution because, well, it’s ‘way cool, man. Don’t assume that just because another customer in the past saw value in something you proposed, that all customers wanting similar services will find the same things valuable. That may be the case, but it the minute you make that assumption, Safford’s first law of proposals will kick in. You also have to bear in mind that some things may not be as valuable to the customer as others. For example, low-price is always something a customer values. However, on-time delivery to help him meet a schedule may be more valuable than price. That’s why you will be able to justify a high price, if you can convince him that you can meet that on-time delivery value. Of course, if the price is too high, the customer may balk; you need to know what that threshold is as well. Know what your customer values. Sounds pretty basic, doesn’t it? It is basic. And it’s simply the most important thing you can concentrate on while you are writing a proposal that is selling your services. How you will do the work. If the customer has released an RFP, he will often ask for this in a Scope of Work or Scope of Services section. What he wants to see is how you will address each of the elements of the project. You need to go beyond just describing what you will do, however; you should explain how you will do it, and why you have chosen to do it in this particular way. Then, of course, you need to make perfectly clear how doing the work your way will benefit the customer. How you will manage the work. You are asking the customer to pay you to conduct some work. He may very well want to know how you will manage the work so that he gets the warm fuzzy feeling that his project is in the right hands and that you will manage it-and his expenditure of dollars-effectively. The management section is one of the most important in a proposal. It is also the section most firms pay the least attention to. Bad plan. The people you bring. Who will do the work is important to most customers. They want to know that you are bringing aboard people with just the right skills to provide just the right service. Special facilities and equipment you have available. If you have specialized equipment or facilities that will make it easier to get the work done, stress them. On the other hand, if you have specialized equipment or facilities but they aren’t appropriate to the job, don’t dwell on them; no one likes a show-off.